Suwanee, Ga. (October 8, 2013) – Omix-ADA®, the world’s largest independent manufacturer of Jeep® parts and accessories, announced today that famed Jeep builder Dave Doetsch will publicly unveil his latest project, Sergeant Rock, at the OMIX/Rugged Ridge Off-Road Success Center at the 2013 SEMA Show in Las Vegas, November 5 – 8. Based on an Anvil Blue 2014 Jeep Wrangler Unlimited Rubicon, Sergeant Rock is a military themed rock crawler that will feature a variety of new products at the SEMA Show from Alloy USA and Rugged Ridge, including the Performance Vented Hood,Hurricane Flat Fender Flares and 17-inch Drakon Alloy Wheels. 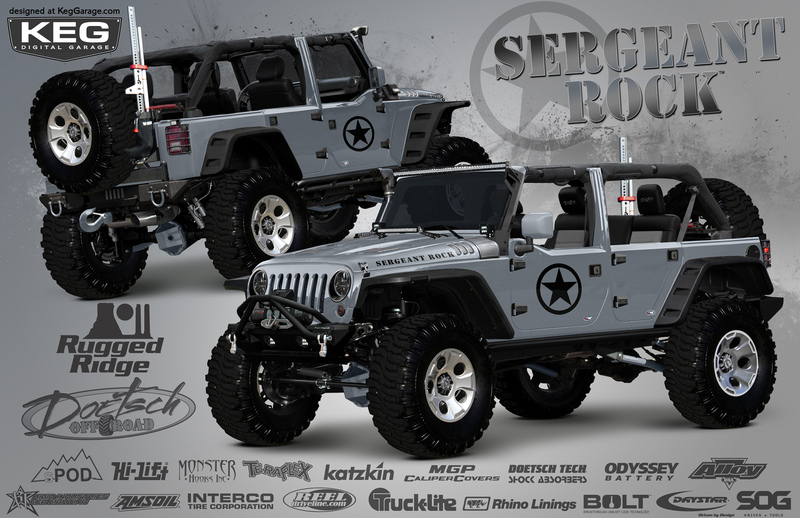 In addition to Sergeant Rock, the Off Road Success Center will showcase a wide range of modern and historic Jeeps, showing the evolution of both the industry and the legendary Jeep marque. The Off Road Success Center will also host a number of other attractions, including autograph signings from celebrity guest R. Lee Ermey, “The Gunny,” a radio show with interviews of the some biggest names in the off-road industry and a live build of a custom military themed 2014 Jeep JK Wrangler. For more information about Rugged Ridge or the OMIX/Rugged Ridge Off-Road Success Center at the 2013 SEMA Show, please contact Rugged Ridge at (770) 614-6101 or visit its website at www.RuggedRidge.com. Omix-ADA®, Inc. is the world’s largest independent manufacturer and wholesaler of Jeep®, truck and off-road parts, accessories and floor liners. For nearly two decades, Omix-ADA has designed, tested and manufactured more than 16,000 of the highest quality restoration and replacement parts and accessories. The Omix-ADA family of brands, Rugged Ridge® and Alloy USA®, are distributed throughout the USA and in more than 50 countries worldwide. For more information, please call Omix-ADA, headquartered in Suwanee, GA at 770-614-6101 or visit http://www.omix-ada.com.